On September 20, a motion was filed by three Texas law firms representing a group of players identified as “Alexander Objectors,” asking Judge Anita Brody to compel compliance with an order that she issued on September 10, 2012. The order, known as Case Management Order 5 (CMO 5) was at the time of issuance, encouraged and supported by Co-Lead Counsel Christopher Seeger. 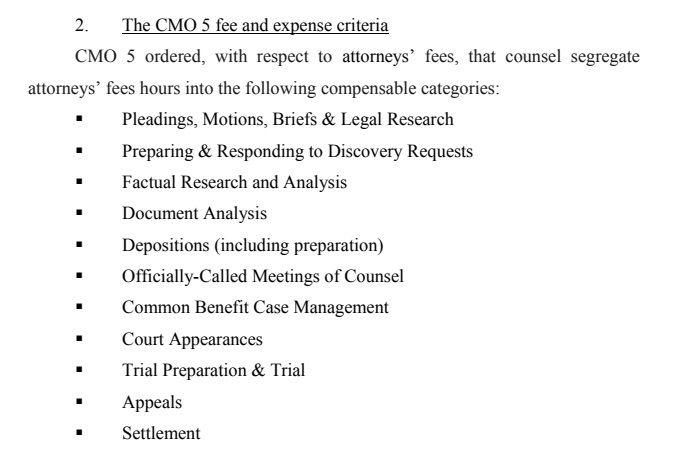 The motion specifically points out areas defined in CMO 5 in which attorneys are not to be compensated through the common fee fund. Also denoted as examples of non-compensable expenses were travel related items such as first class airfare, dry cleaning, movies, and alcohol. 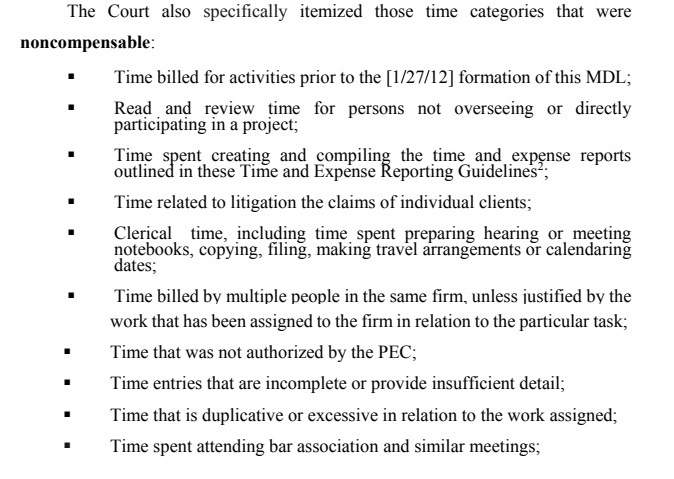 CMO 5 also mandated receipts in order to verify the legitimacy of expenses. In addition to attorneys’ fees and expenses the petition posited payment of $100,000 to each of the three named Class Representatives in the concussion suit in addition to whatever settlement awards they may receive. 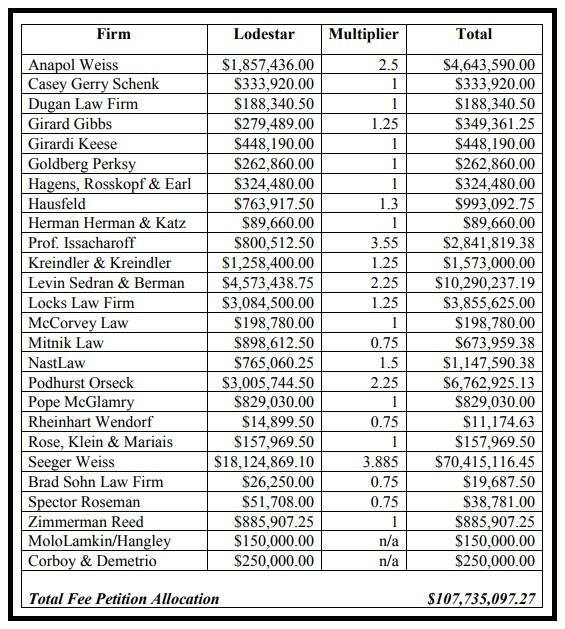 Proposed attorney fees are laid out in the following table. 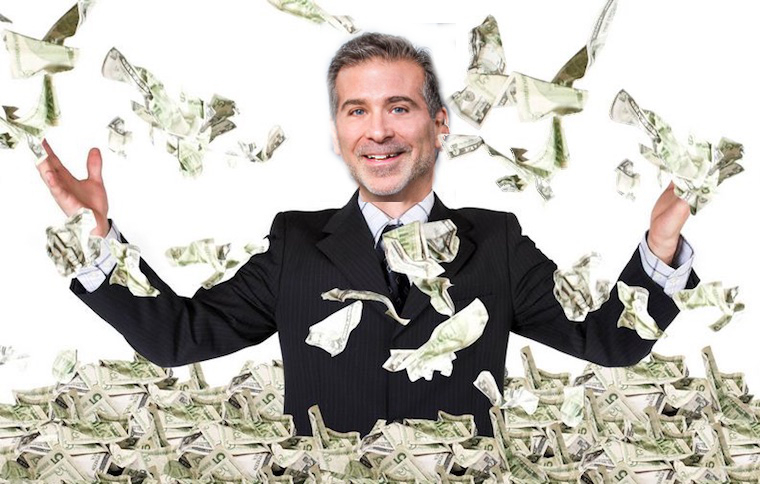 As predicted by Alexander Objectors, one of Class Counsel’s objections was in fact “nitpicking.” While no reasonable person would debate that Seeger-Weiss has invested a great deal of time and human resources into the settlement. In the interest of transparency, however, it would seem prudent that a specific breakdown as dictated by CMO 5 be entered into the public record as opposed to categories of work and a general description of each. While the request may have been voiced by Alexander Objectors, the information is of great interest to and subject to speculation of Class Members, Media and the general public unless actual records are disclosed. In addition to the fees for completed work Co-Lead Class Counsel has petitioned the Court for an additional 5% hold back from all awards. This seems to be a reasonable request. Alexander Objectors’ side by side comparison points to Co-Lead Class Counsel’s remarks in the left column with questions and objections in the right. 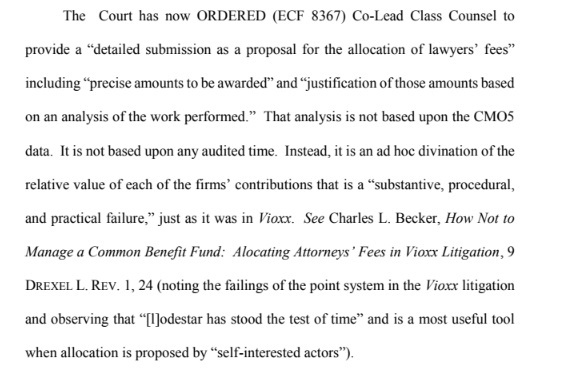 Alexander Objectors elaborated on Co-Lead Counsel’s methodology, which they view as flawed, citing the Vioxx Class Action lawsuit in which Christopher Seeger was a lead negotiator. Transparency is a major factor that has been lacking in the Concussion Settlement. 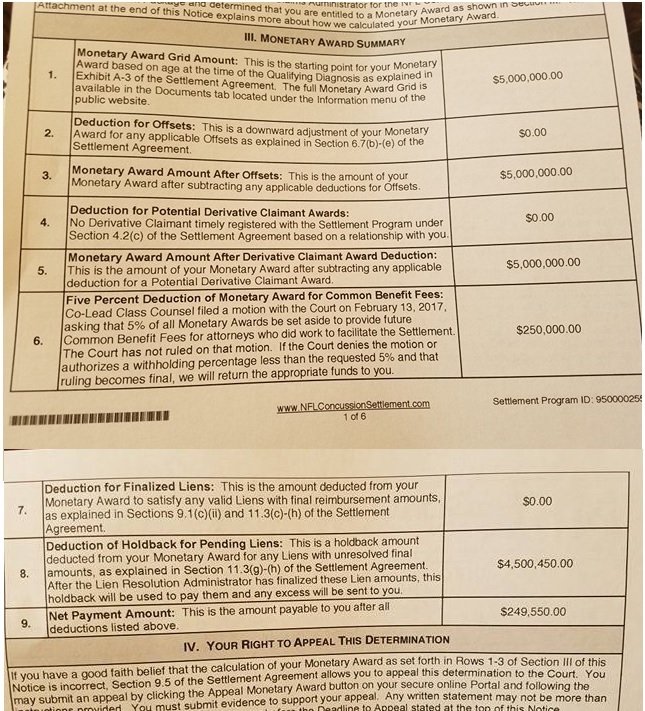 Liens that are only vaguely explained are being deducted from settlement awards as shown below and as the subject of an article I wrote in early August. Class Members do have the right to dispute and negotiate liens, and general negotiations by lien administrators Garretson Resolution Group are most likely taking place for Medicare and Medicaid liens, but it would seem reasonable for Class Members to have a more specific idea of what they may eventually have deducted as opposed to the lien administrator withholding either the maximum allowable for medical liens or his estimate of what they may be based on diagnosis. It would also seem that players and their families who already feel the emotional, physical and financial ravages of football related neurocognitive impairment should not be further distressed by ambivalence and uncertainty regarding how much (or how little) of their award they will receive. Other players wonder if they will even receive an award at all despite a definitive diagnosis for the conditions covered in the settlement. Numerous motions have asked the Court to step in and administer the contract as it was written without presenting de facto amendments which make pre-settlement claims much more difficult than described in the agreement. As of today, I’ve been able to locate one dementia claimant who has been approved for a settlement award. All other pay-outs that I’ve been able to verify have been ALS and death with CTE diagnoses. In a conference call I participated in some months back, Class Counsel stated that every claim with a definitive diagnosis would be promptly paid. The opposite has occurred. Every claim I have information on with an Alzheimer’s or dementia diagnosis, has been held up with deficiency notices and kept under review, even for players whose diagnoses survived the stringent determination process of the NFL’s 88 Plan which is very difficult to qualify for. 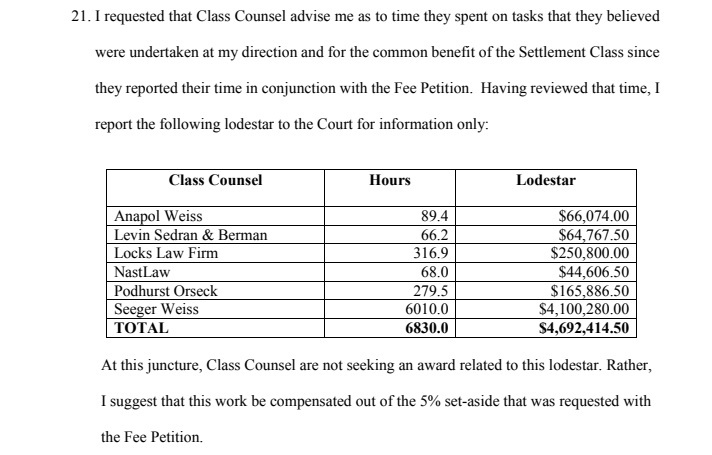 Though Co-Lead Class Counsel stated in his fee petition, “Seeger Weiss receives and responds to hundreds of telephone calls each month from Class Members and lawyers representing Class Members” which is no doubt true, numerous Class Members have reported repeatedly calling only to get, “Talk to your individual attorney.” Often the attorney’s calls go unreturned as well. My repeated email requests have gone unanswered. The single status report is now almost five months old. Updated figures were briefly mentioned in a conference before Judge Brody and a declaration from Orran Brown, both in September, but neither of these are easily accessible to Class Members unless they are adept at checking court dockets and are relentless in doing so. Most are not, nor should they have to learn a new skill which costs .10 for every search and .10 for every page for each document they wish to read. The last statement seems to be an accurate description of the NFL Concussion Settlement to date. 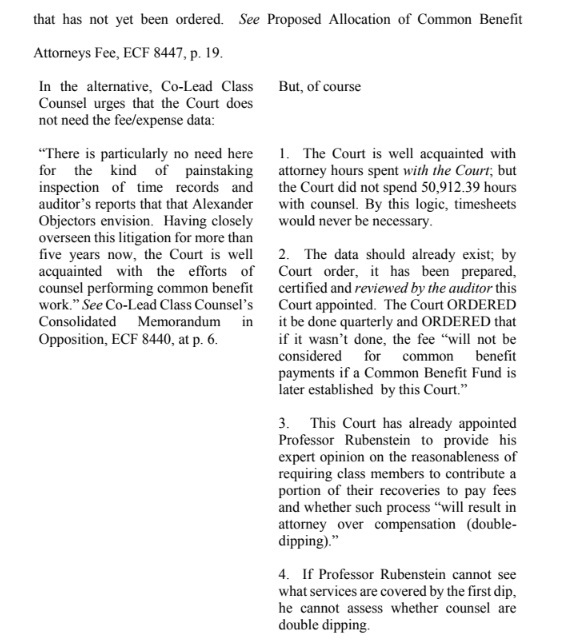 The bulk of motion practice engaged by Class Counsel has been in regard to fees. It would seem beneficial and prudent in this instance to remember the reason for the litigation and the people for whom the primary benefits were intended.